This history will be added to as I am able to spend some time going through all the old records and photo’s held by the Group. I have been able to create a page full of pictures of the group going back to the early 1950’s. These pictures will change as I am able to scan more in. As for a more detailed record of what the group has been doing from its creation in 1911, ex-CSL and Group official Christine Wheeler, has been able to create a short history which can be viewed below. 1911 2nd Orpington Scout Group is formed by the Vicar of All Saints Church. 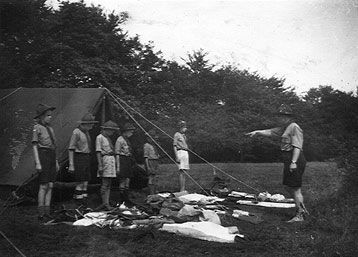 1912 First Scout Camp held at Goddington Park. 1925 Registered with the Scout Association as 3rd Orpington. 1927 Re-Registered as 2nd Orpington when Orpington District was registered. 1937 Re-Registered with A.E. 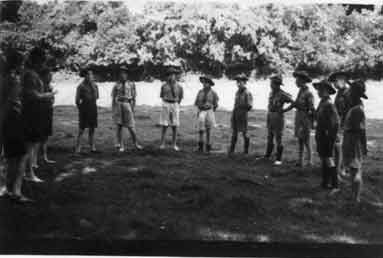 Shaw as Scout Master. First Cub Pack started. 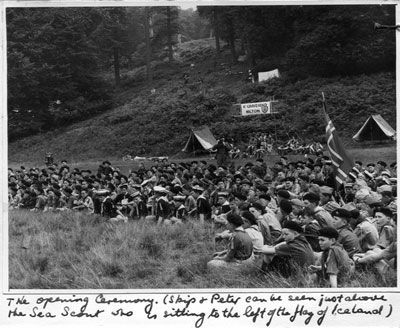 1938 Membership consisted of 22 Scouts and 8 Cubs. 1941 A.E. Shaw was presented with Medal of Merit. Bark Hart Buildings used as HQ after repairs and decoration by the group following bomb damage. 1961 Occupation of the new HQ, Shaw Hall, at present site. Purchased from the LEB. Moved and erected by members of the Group. 1970 First discussion on plans for the new building. Scorpion Venture Unit started. 1972 Third cub pack start – Now Panthers, Leopards and Lions. 1977 Plans drawn up for new building and fundraising started. 1980 Venture Unit re-opened under Pete Minis. 35 Scouts and 45 Cubs in Group. 1983 Troop up to 56 – Split to form Bears and Bison’s. Mo Stagg SL of Bears, Terry Mullard SL of Bisons. 1984 Bear Troop Summer camp to Ireland with 73rd Cork. 1985 New building started. New building is built around the old building, to allow group to carry on using the HQ for meetings. 1988 Group moves to 1st Orpington whilst Old Building Demolished and New Building Completed. New HQ officially opened on 12th November. 1990 Bison’s closed. Bears down to 8 Scouts. 1992 Second Beaver colony opened – Disney. First colony named Winnie the Pooh. Bears upto 56 scouts. Bison’s re-opened with 18 bears. Campdowne 92 at which we hosted 73rd Cork. 1994 Group up to 200 uniformed members. 1995 Lions closed on 31st December due to lack of leaders. Scorpions closed due to lack of leaders and then reopened under new leadership with influx of boys from the troops. Bear Troop and Venture camp to Sweden with Astorp. 1996 Campdowne 96 sub camp run mainly by 2nd Orpington leaders and ventures. Hosted Astorp and 73rd Cork. 1997 Venture camp to Ireland. 1998 Bear Troop and Venture camp to Kandersteg in Switzerland. 2011 1st Ramsden moves out of their hut and joins 2nd Orpington. There is now 2 Cub packs, Panthers and Wolves and 2 Scout Troops. Due to low numbers of Scouts both troops join to become 1. Troop takes it’s name from Bisons and Rams to became Ramsons. 2014 Explorer trip to Tanzania for 3 weeks. Explorers from Dulwich and Broadstone Warren also attend. Second Beaver Colony opens on 14th November and is known as Kiwi and starts with 4 members. 2015 Bears Scout Troop reopens in September. 2017 Panthers and Wolves have another joint cub camp in September that had 43 cubs in attendance, 15 of which was their first camp.